Is Derek Jeter secretly planning a wedding? Did Derek Jeter trade baseball for domestic bliss? It could be, according to TMZ. Derek Jeter played his last game for the New York Yankees and retired from professional baseball last weekend, so maybe he’s just having a retirement party. Then again, maybe he’s not. TMZ reports the MLB star is planning one heck of a bash. He’s booked Long Island’s historic Oheka Castle, where scenes from the 1941 classic film Citizen Kane were filmed. He’s also booked some high-end vendors, according to TMZ, who will be throwing a “Derek Jeter event.” What might that event be? Sources are split, TMZ reports. Some say it’s just your average giant retirement party for one of the biggest baseball stars alive. Others say it’s a surprise wedding. Jeter has been dating swimsuit model and St. Thomas native Hannah Davis for several years. The two haven’t publicly announced an engagement — or any other recent relationship developments, for that matter — but they’ve historically been pretty private about all aspects of their relationship. And, reportedly, Davis was spotted out on a Starbucks run about this time last year wearing what looked like a diamond engagement ring, even though keeping that on the down-low for an entire year would be quite the feat. According to People, Jeter’s reps and reps for the venue didn’t return requests for comment, while a spokesperson for Davis declined to comment on the possibility of upcoming nuptials. Romantic redux for Derek Jeter and Minka Kelly? The party that may or may not be a wedding is set to go down this weekend, so we’re bound to find out the truth soon enough. Time to place your bets. 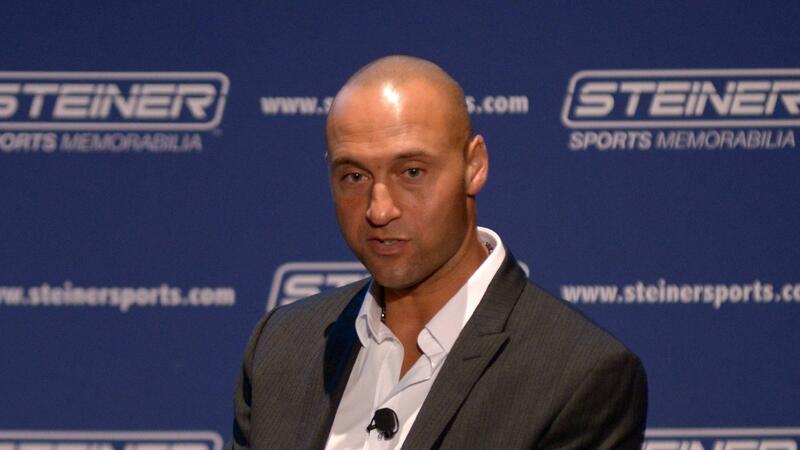 Is Derek Jeter’s upcoming bash just a retirement celebration? Or are there wedding bells in Jeter’s very near future? Tell us your take in the comments. UPDATE: This rumor is… false! Jeter and Davis spent the weekend in New York City and were spotted at the Conrad New York hotel on Saturday night and a neighborhood Starbucks Sunday — definitely not Oheka Castle. And they definitely were not wearing wedding bands.